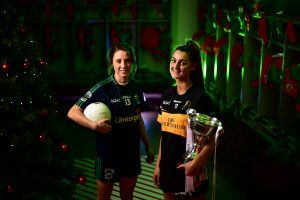 PLAYERS and mentors from the six participating teams in next weekend’s All-Ireland Ladies Club Football Finals gathered at Croke Park for Captains Day on Tuesday, December 4 – and there was a festive feel to proceedings! 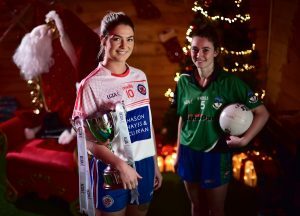 Christmas will come early for the three clubs who are successful in the All-Ireland Senior, Intermediate and Junior Club Finals, which will be played next Saturday and Sunday, December 8/9. There’s a double-header at Parnell Park on Saturday as Foxrock-Cabinteely (Dublin) and Mourneabbey (Cork) go head-to-head for the Senior title at 5:15pm, before Clontarf (Dublin) and Emmet Óg (Monaghan) clash in the Intermediate Final (7:30pm). Both games will be televised LIVE by TG4, while RTÉ Radio 1 will also broadcast the senior Final LIVE. On Sunday, it’s the turn of the Junior Finalists, namely Glanmire (Cork) and Tourlestrane (Sligo), who will meet at Duggan Park in Ballinasloe at 2:30pm. For the fourth time in five seasons, Mourneabbey will contest the All-Ireland Ladies Senior Club Final. The Cork and Munster champions, who have newly-crowned TG4 All Star sisters Ciara and Doireann O’Sullivan in their ranks, lost out in the 2014, 2015 and 2017 Finals, but will hope to make it fourth time lucky. Foxrock-Cabinteely captain Amy Ring (left) with Eimear Meaney of Mourneabbey. Their meeting with Foxrock-Cabinteely is a repeat of the 2017 semi-final, which Mourneabbey won after extra-time, before they lost out to Carnacon in the showpiece decider. Foxrock-Cabinteely, who have a number of Dublin stars in their team, including six-time TG4 All Star Sinéad Goldrick, were beaten finalists against Donaghmoyne (Monaghan) in 2016. As neither senior Finalist has won the All-Ireland Senior Club title before, a new name will be inscribed on the Dolores Tyrrell Memorial Cup after Saturday’s eagerly-anticipated fixture. Both teams came through tough semi-finals to make it to Parnell Park, with Foxrock-Cabinteely accounting for Donaghmoyne, while Mourneabbey defeated Kilkerrin-Clonberne on Galway soil. The Intermediate Club Final pits Dublin against Monaghan, as Clontarf take on Emmet Óg. Clontarf captain Sarah Murphy (left) with Emmet Óg captain Nicole Rooney. In the Junior Final, Glanmire seek to follow in the path of last year’s winners Aghada by bringing the silverware back to Cork. 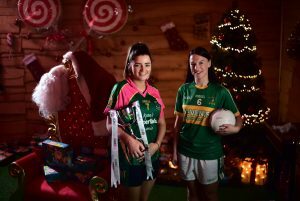 Captains of the All-Ireland Ladies Junior Club Finalists: Amy Turpin of Glanmire (left) with Tourlestrane’s Shauna Henry. Clontarf, Emmet Óg, Glanmire and Tourlestrane are all first-time All-Ireland Club Finalists.